The whoswho application has a couple of features to help you view and search your address books using a web browser. The script is fairly simple. It just uses an XSL stylesheet to transform the Address Books from XML to valid HTML. 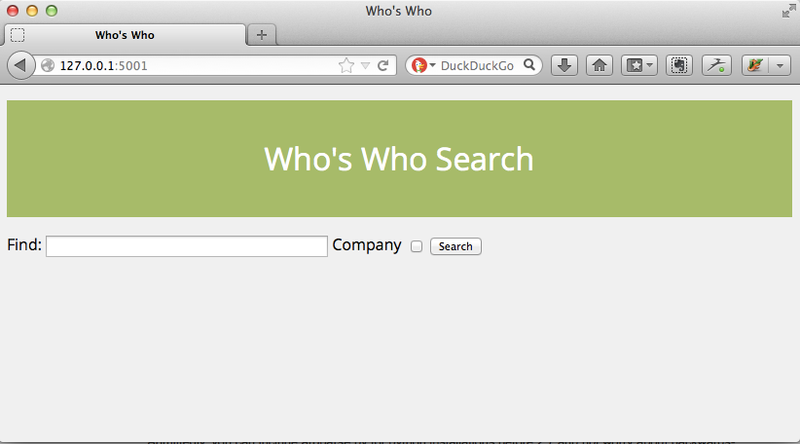 whoswho includes a fully functioning web application that will let you search your address books. Enter your search term in the ‘Find’ field and press ‘Search’ to see people from your address book. If you want to use a company name to search on click the ‘Company’ check box. If you would like a more permanent version you can deploy the application to a WSGI server. Just follow the instructions for your server of choice in the deployment options section of the Flask documentation.